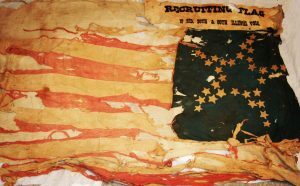 This American flag with 34 stars was used in recruiting by Company H of the 22nd Illinois Volunteer Infantry Regiment, Company C of the 30th Illinois Volunteer Infantry Regiment, and the 80th Illinois Volunteer Infantry Regiment at the beginning of the Civil War. The 80th Illinois included brothers James Harrison Claybourn and William Pratt Claybourn. James McHenry carried it in recruiting for Company “H” of the 22nd Illinois. It went to Belleville, Illinois, with companies “H” and “I” in May of 1861. The flag was returned to Randolph County and carried by Henry McDonald with Captain Alexander Wybus’s Company to Jefferson Barracks in St. Louis. The company disbanded there, some men going into the 10th Missouri and others into the 5th Illinois Companies, but the greater number went into Company C of the 30th Illinois. The flag was then carried by Macdonald with Companies C and E of the 30th Illinois to Belleville, and thence to Birds Point, Missouri. At Birds Point, flag owner James McHenry presented the flag to Charlie E. Brown of Blaire. It was then returned once more to Randolph County and used as a recruiting flag for Company G of the 80th Illinois. Charlie E. Brown took it to Centralia as the Company G flag for the 80th Illinois, but Col. Thomas G. Allen then used it for the entire regiment as the regimental flag for 80th Illinois until the regiment received colors from the government at Louisville, Kentucky. After the war, Mr. Brown presented it to the high school museum at Sparta, Illinois. The ladies who made this flag are as follows: Mrs. Mary Ann McHenry (mother of Dr. James McHenry of the 22nd Illinois and of Mr. John McHenry), Mrs. James Ward, Mrs. Barbara Gordon, Mrs. Ann McLaughlin, and Mrs. Mary McLaughlin. It is now housed at the University Museum at Southern Illinois University.